Our GPS trackers make it easy to find a specific person or item. These pocket-sized devices use GPS and cellular technology to transmit its location, so you can track locations on a map using a smartphone or computer. 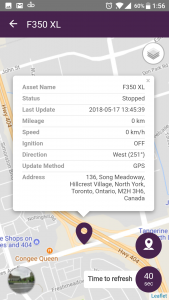 GPS Tracking Toronto real time tracking lets you see where your assets are and their current status in real time. Our GPS Vehicle Trackers are enabled with powerful batteries that can last from a couple of weeks to six months. The units are self-contained in a weatherproof housing. Features include worldwide coverage, geo-fencing, custom notifications, and the ability to view location history up to one year. Please note that battery life depends on specific settings used. If location update settings are changed from every thirty seconds to three minutes, this will drastically increase the battery life. There are a variety of uses for GPS trackers including asset management and personal security. For more information on GPS tracking in Toronto, speak with one of our experienced licensed Private Investigators today. Contact us for a professional and friendly no obligation quote at 1-800-977-0337.